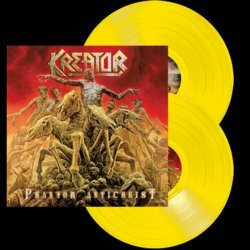 KREATOR - PHANTOM ANTICHRIST YELLOW VINYL (2LP) | Online Shop | Wizard LTD. Album: "PHANTOM ANTICHRIST YELLOW VINYL (2LP)"
Being around for nearly 30 years, Germanys biggest export in thrash metal, KREATOR, have proven to be persistent, innovative and an unstoppable force. Miland “Mille” Petrozza have inspired generations of young bands with their early efforts like “Endless Pain” (1985), “Pleasure To Kill” (1986) or “Extreme Aggression” (1989), but also made statements by their most recent outputs “Violent Revolution” (2001), “Enemy Of God” (2005) and “Hordes Of Chaos” (2009). Enter 2012, KREATOR have finally found a new home with Nuclear Blast Records and deliver the most diverse, melodic and intense album of their entire, long running career. Produced at renowned Fascination Street studios in Orebro, Sweden with famous producer Jens Bogren (OPETH, KATATONIA, AMON AMARTH, SYMPHONY X), “Phantom Antichrist” comes with a clearly transparent, powerful and thundering sound. The classic and impressive artwork which makes the package just perfect was created by Wes Benscoter, who had worked with the likes of BLACK SABBATH, DIO and SLAYER before.